Eagle Superabrasives is a premier supplier of CBN Wheels located in the United States. With an extensive inventory of over 6,000 cbn wheels and other superabrasive wheels in stock, we are capable of shipping ninety-percent of orders same-day. If you’re looking for high-quality abrasive products and superior customer service, Eagle Superabrasives is your one-stop shop. Due to their outstanding wheel life and wear resistance, CBN Wheels are quickly start to dominate the superabrasive industry. CBN Wheels are extremely cost effective in high volume production scenarios. CBN stands for cubic boron nitride, a man made material that follows a close second for hardness when compared to diamond. Diamond may be a harder material, however, CBN rivals diamond at extreme temperatures. At high temperatures, diamond begins to lose its hardness while CBN maintains its strength and hardness. Contrary to a Diamond wheel, a CBN Wheel is not suitable for grinding carbide materials. CBN wheels are the best, when it comes to grinding steels. Unlike diamond which loses its carbon atoms when grinding steel, CBN wheels hardly create a high-temperature. CBN has an extremely good thermal conductivity, meaning it provides a cool clean cut and less sparking from the wheel. A cool cutting experience helps maintain the integrity of the bond. A CBN wheel typically does not break down from wear, instead the breakdown of the bonding layer will cause a subsequent wheel wear. Our chemist and engineers, here at Eagle Superabrasives work constantly on advancing our bonding systems to ensure that our grinding wheel bonds stay intact and provide an extremely long work-life. If you would like to read more about our CBN Wheels, click here. 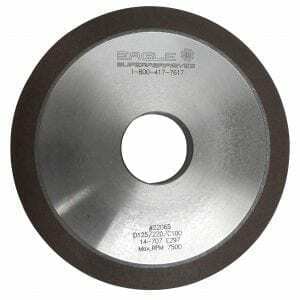 Eagle Superabrasives is a leading supplier of CBN wheel and in the industry. We not only supply CBN wheels, but offer a vast variety of grinding wheels and sizes that will meet your business needs. When you’re ready to try the best, trust the experts at Eagle Superabrasives. Our experienced staff will provide support and advice along the way. With unparalleled customer service, superior products and fast shipping, Eagle Superabrasives is an easy choice for all your grinding needs. Contact us today to place an order!